Provide comfort for the family of Evelyn Allen with a meaningful gesture of sympathy. Ms. Evelyn Edis Kathleen Allen was born in Cavalee Hill Montserrat W.I. to the late Edward O’garro and Maude Allen. Nal married John Joseph Allen on July 26, 1963 this union bought forth 4 children. Teacher Nal (as she is known to many) became a teacher at the tender age of 16 after graduating from Cavalee Hill School. Miss Nal immigrated to Boston, Ma in 1969 with her husband and children. Nal worked at Jay’s Work Room as a seamstress for many years until she decided to further her education. She enrolled in Nurse’s Aide training classes. This training led to her employment at New England Medical Center where she worked as a nurse’s aid for 24 years until her retirement in 1994. Nal was a very creative person and was passionate about embroidery, crocheting and ceramic making. After her retirement she attended ceramics classes at the Salvation Army until 2006. Nal was a faithful member at the Bethel Tabernacle Pentecostal Church pastored first by the late Bishop Thomas and Evangelist Susan Weeks under whose leadership she founded the church’s Nurses Guild. 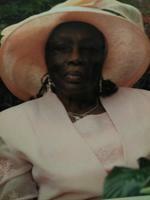 At the time of her death she was under the leadership of Bishop Dr. Gwendolyn G. Weeks the current pastor of Bethel. Known as Mommy and Na to her many grand and great grandchildren she unselfishly raised her two granddaughters Nicole and Monique. Evelyn is preceded in death by her husband John Joseph Allen; her loving sons Leroy Allen and Hilton S. Allen. She leaves to mourn her passing her loving sister and friend Florence Weeks; her children Glennitta (Sister Darrell) Edwards, Lorriston (John) Allen, Kim and LaVern Allen; 17grandchildren: Bryan, Rasheed, Christopher, Dion, Shioneka, Bryan, Lorriston II, Bianca, John John, Jamil, Javal, Jerome, Shawn, Devin, Devaughn, Nicole (Troy) and Monique; her great grandchildren Janice, Matthew; Niele, Eilliot, Anaiyah, Akira, Zion Christopher Jr., Malik, Jiana, Hope and Kyrie and a host of nieces, nephews, family and friends. Also left to mourn her, is her loving cat Princess. To send flowers in memory of Evelyn E Allen (O'Garro), please visit our Heartfelt Sympathies Store. Provide comfort for the family of Evelyn E Allen (O'Garro) by sending flowers. So sorry to hear of Ms. Allen's passing. My grandmother did ceramics with her at the Salvation Army. May God continue to give you peace and hope at this time. Sending my love, condolences and prayers of comfort John and the Allen family today as well as in the difficult days ahead.